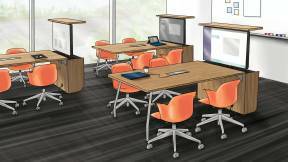 The addition of an Active Learning Center helped the University of Saint Mary take an active learning philosophy campuswide. Remember college and that lecture class where the professor stood at the front of the room and repeated facts to hundreds of students for hours? Then, the test was based on what you memorized? The days of regurgitation as a means to success are on the way out. At the University of Saint Mary in Leavenworth, Kansas, library director Danielle Dion is part of a team embracing active learning throughout campus. 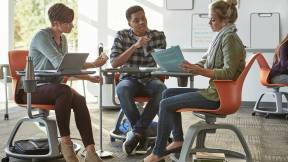 Her school partnered with Steelcase Education and became the first to take advantage of the Active Learning Center Grant for its library — transforming part of it into a hub of activity. 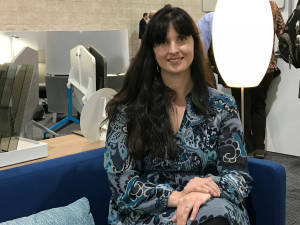 360 caught up with Danielle at Educause 2017 where she spoke about her school’s active learning journey to creating innovative learning spaces. 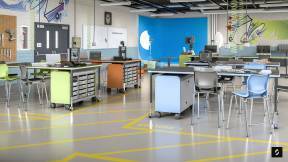 360: Where were you on your active learning journey when you received your new space? When we saw the grant was available, we pulled all of our resources together. The active learning team was made up of librarians, staff and faculty. We reflected on where we wanted to go if we were to receive the grant as well as what impact it would make on our campus. 360: What happened when you found out you had been awarded the grant? Danielle: When we found out we were the first library to receive it, we were ecstatic. We ran across campus. I even remember I went and camped out in front of the president’s office to tell her and the provost we had received the grant. That was a really exciting day to be able to share that information with both of them and talk about the next steps of how we would implement different types of furniture and technology into the space. Over the course of the next few months, we started meeting with Steelcase representatives and figuring out how our space could be renovated. 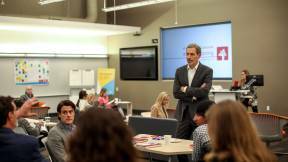 Over the summer of 2016, the Active Learning Center was created. As faculty came back to campus, we held our faculty day in the Active Learning Center and had a Steelcase active learning trainer come that day. So, right before the start of the semester, our faculty was able to learn about active learning and how to utilize the space. 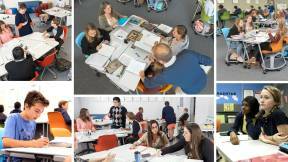 Browse resources, sign up for updates and submit your proposal for this year’s Active Learning Center Grant from Steelcase Education. 360: What were some of the changes in behavior you’ve seen with the faculty at Saint Mary? Danielle: The faculty and staff who utilize the space are doing all kinds of unique approaches that they have not been able to do in their classrooms. We conducted a lunch and learn in the fall and then in the spring of this year (2017), we held a reflection to help people share how they were using the space. Then, faculty from different departments could hear new ideas. That worked very well. Now, we’re in a different academic year and we even see more departments and more faculty using the space. 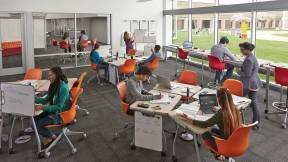 360: Are there other ways you facilitated educators sharing how they’ve used the space for active learning? That experience alone with the new Active Learning Center initiative across campus has spurred people to recharge. They’re finding new ways to use different technologies and different kinds of furniture configurations. 360: Can you share how the instructional techniques and active learning pedagogies have evolved over time? Danielle: When you would walk into the space, if you were to sit on the sidelines during some type of instruction session with a faculty member, what would stand out would be how loud it is. I walk in and I see conversations happening. I’ll see different pods set up for the tables and chairs. Students are working together to solve problems and then reflecting as a group. I very rarely see the old stand-in-front-of-the-group lecture format. I’m seeing the faculty engage with the students, walking around the room, doing some kind of activity with each of the different groups. That has been something I have seen evolve over time. 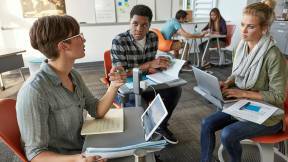 The students themselves have become more comfortable with learning from one another. They work amongst themselves instead of just listening to someone share information and then regurgitating it for a test. Faculty have used the space to reimagine certain exercises and assignments into a more collaborative format. 360: Can you tell us about a specific educator you’ve personally seen impacted by this active learning philosophy? Danielle: Our world history professor comes to mind immediately. She also runs our Center for Peace and Justice. Prior to us having the Active Learning Center, she would routinely hold lectures and different types of activities based on how our campus is engaging with the world. She worked to create social justice projects, but she didn’t have space in her own department to host events or engage in activities that would bring the entire campus together. I would say she uses the Active Learning Center the most. She reserves it at least two or three times per week for a community event. It sometimes even includes people outside of the Saint Mary community from nearby cities. Having that space has been instrumental in facilitating our campus mission in support of social justice. 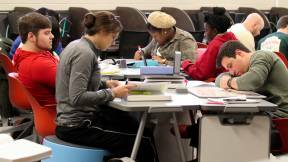 360: What were some of the motivators that inspired people to explore and experiment with the Active Learning Center? Danielle: One of the main motivators was seeing how the students were using the space themselves. Faculty would walk through the library and see how students, with no parameters, would utilize the space. 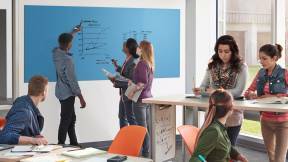 They configure the tables, set up pods of study groups and write on the big whiteboard. That may have motivated faculty to say, “I could bring my class here. 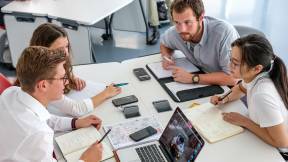 I could do something different than what I’m used to doing.” Faculty started re-imagining how that space could influence how they were teaching and engaging students. 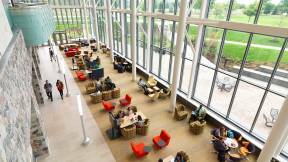 360: What surprised you the most about the active learning space? Danielle: I knew it would be used. I knew it was a very needed complement to other spaces on campus. What surprised me the most was the level of usage. I was not anticipating that we would have as many requests as we do. In the first year after receiving the grant, we had 375 individual activities held in the space. We kept statistics for everything, so we knew how many times a certain professor was requesting the space and how many student clubs had used the space. I have just been floored by how many students are requesting usage of the space and how many students feel they have the ownership to reconfigure things in there. They’ll put on a movie for their student group and take advantage of the different technologies available. The best example of success is how often the students are reserving the space, and when it’s not reserved, it’s still packed with students. 360: What’s your advice for other educators who are new to active learning or are just beginning to incorporate it into their curriculum? 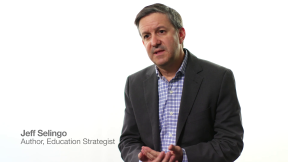 360: What are your goals for the future of active learning at the university? Danielle: We want to continue growing and expand how we use active learning techniques and pedagogies throughout campus. We want to think about all the different learning styles we might have and how we can make sure we’re including all of those in our initiatives, not only in the Active Learning Center, but across the board. Learn more about how the physical environment can support active learning and about the Active Learning Center Grant by visiting our new online grant experience. Danielle Dion is library director at the University of Saint Mary in Leavenworth, Kansas. Prior to her work at USM, she served as research, learning and assessment services librarian for Rockhurst University.